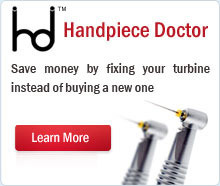 At Handpiece Doctor we offer the dentist solutions to handpiece problems caused by heat sterilization and everyday use. A typical dentist may own up to ten handpieces, all of which will require servicing once or twice a year. Almost all of our customers send in handpieces on a regular basis and remain very loyal to us once we demonstrate our ability to solve their handpiece problems quickly and effectively. We specialize in providing two major advantages to the dentist; rapid turn around on repairs, and we are less expensive than other alternatives. Dental professionals are very accepting of our service when faced with the high cost and long lead times for repairs returned to the manufacturers. We provide one day service on all repairs if the replacement parts are in inventory. In most cases we repair and ship the handpieces back the same day we receive them. We also offer free pick up free delivery to local offices and convenient postage paid mailers to those out of the area. We deliver friendly, personal service that builds a strong repeat customer base. There are two basic types of repairs. Our standard high speed handpiece repair costs only $80 versus $180 to $300 from the manufacturer. Low speed repairs cost $159 while the same service can cost up to $350 from the manufacturers. We customarily charge about half of what manufacturers do while offering the same quality and a full warranty on all work performed.